There's been a lot of articles all over the net in the last 6 months about the power that the new Cell Processor (from the PS3) offers and the potential that have when linked in paralle clusters. I read one particular article where several MIT students linked 16 PS3's to form their own Supercomputer because they couldn't get enough time on the campus system. So surely the time when we'll all have supercomputers in our homes isn't far away? Well, with NVidia's new “Tesla personal supercomputer” you can now have the serious digital horsepowerof a supercomputer at home. The beast delivers cluster computing performance and up to 250 times faster computing then a standard top of the range PC. 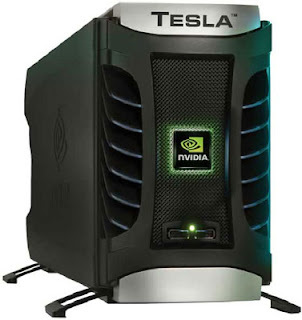 The Tesla is powered by 4 GPU’s, each with 240 processing cores (that 4x240=960 cores working in parallel) based on the NVidia’s CUDA architecture, delivering a gigantic maximum performance of nearly 4 Teraflops! The only bad news is that you'll need to spend about $10,000 to pick up one of these monsters. If I had the money I so would!